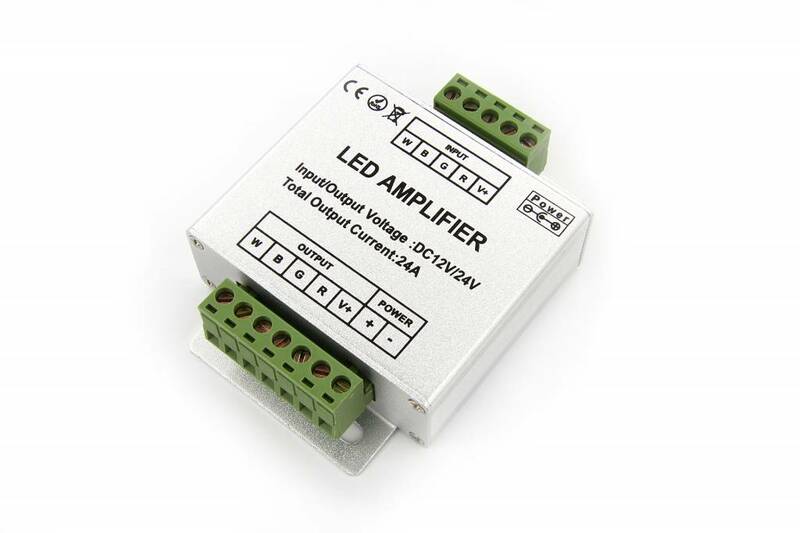 RGBW led strips amplifier to amplify the output signal from another serial connected RGBW strip towards a new one or to extend the power output of an RGBW controller with an additional 24 Amp. RGBW 12 Volt power will drop sharply if it transported (trough led strips or cables) over distances longer than 5 meters. Use this RGBW led strips amplifier together with an additional power supply to extend your RGBW signal over greater distances and amplify it back to full power to supply each additional 5 meter RGB ledstrip. 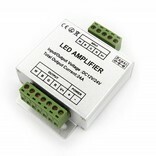 Or just extend the power output of an RGBW controller with an additional 24 AMP. Depending on the chosen power supply(*) you can connect maximum two RGBW led strips in parallel to this device.